I started this painting so many years ago I can’t even remember where exactly it’s of anymore. 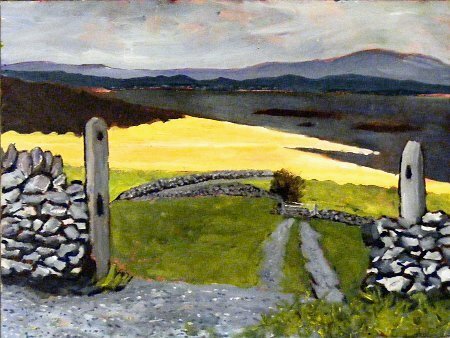 It was originally of a scene somewhere in the Killary Harbour area, the fjord that separates Connemara from Mayo. I’ll have changed it since then though, because you can do that with a paintbrush, and my memory isn’t what it used to be. Before my brief attempt at living in Donegal, north of Killary was where I had most looked to live (after fruitless searches for a cheap cottage on Innishmaan). When it was finished it went straight to Russia with Coast, The West, which is why it’s not a great photo - the light was lousy in the few minutes I had with it. To The Beach is SOLD. Even nicer than I remember.